'The political mood running up to the vote was one of hope. The people trusted the UN to provide security and to provide a presence after the ballot on 30 August. There was intense fear amongst the people--threats had been made to nearly all villages in East Timor that if the vote wasn't for autonomy then everyone in the village would be killed, and the words of the militias were, 'There will be a return to 1975'--meaning the massacre of 200,000 people. So there was a climate of fear. There was ample warning to the UN and the international community as far back as November that the connection between the Indonesian military and the militias was quite clear. This had been told to Kofi Annan. The day of the vote was reported as passing very peacefully. There were several incidents where the militia fired gunshots or attacked people going to vote. There was still an intense amount of fear. We interviewed a family that had been attacked on the Thursday night before the vote. The husband was taken away and beaten up by the militia--he was lucky that he was still alive the next day when he came back. And on leaving the house we passed him on the way back from the voting station. He was limping and struggling, he could hardly walk, and a few of his friends were helping him. But he had the bravery to go out and vote. The overall feeling was that the number of people who had voted was absolutely amazing, and with great bravery and determination. There was still apprehension. The night before the result I left East Timor--I was in Darwin and I had a three hour chat with Jose Gusmao, the son of Xianano Gusmao. I asked him about the threat of violence. His biggest hope was that, in his words, 'The skin of a crocodile is always stronger than the grip of a garuda'--the crocodile referring to East Timor and the garuda referring to Indonesia. I remember leaving for the airport. The head of the militia in Dili turned up with 15 or 20 militia members. He'd already promised a few days earlier that they were going to block the airports and the ports, and not let any pro-independence or East Timorese politicians from either side leave the country. They were on immigration, they were on every door, and they were stopping people from going through and questioning who they were. The immigration, the police and the airport security staff stood by and didn't do anything. There were three or four camera crews filming them and they just didn't care. They didn't want East Timorese politicians to leave, and we now know why. Many independence leaders have been hunted and killed in the last week. The UN force will definitely make a difference--the situation is definitely going to change. There's a lot of pressure on Wiranto and Habibie to control their forces. But we've got to remember that these are the people who've been committing the murders over the last week, and over the last 25 years. Their attitude is to destroy and kill as many of their enemies as possible, and cause as much destruction to the people of East Timor and the country as they can. So it's up to Wiranto and other people to make them abide by the UN peacekeeping force. Now it's very unclear who is actually giving the orders. There are a lot of Indonesian generals who have vested interests--financial and business--within East Timor, and they stand to lose a lot. As do the East Timorese civil servants, who are the main pro-autonomy leaders--so that's why they're putting up such a big stand at the moment. What was the atmosphere like in East Timor in the period that you were there in the run up to the election? Incredibly tense and very determined. The supporters of independence were well informed, very prepared to vote, and worried about militia attacks. Indeed, Dili was full of rumours all the time about militia attacks here and there. To some extent I discounted them as being a bit panicky, but it was quite salutary when one day just before polling they said there was likely to be trouble in the area where we were staying in Dili. We heard gunfire all night and three people died. The militia were organising roadblocks, selectively stopping vehicles, pulling people out of them, taking them away and generally intimidating people all around the city. It was probably worse in the villages. One or two militia would live there and intimidate people. If there was any retaliation against the militia then they would come in much larger numbers and simply burn the village down. Was it obvious while you were there that the Indonesian army and the militia were operating closely? Yes it was, in the sense that militia were coming out of army bases and at the same time pretending to negotiate a sort of ceasefire arrangement through the UN. The militia didn't keep any of the agreements. I don't think anybody expected the situation to be as bad as it was straight after the referendum. Everybody thought there were going to be some difficulties. In the few hours after the referendum it wasn't too bad. Then the situation deteriorated. We had a meeting of parliamentary aides for East Timor at the Archbishop Belo Centre for Peace and Reconciliation. I heard yesterday that the very kindly nun who arranged the meeting there for us was shot at her desk when the militia walked in. That really brings home to you just how vicious and evil the forces of the Indonesian army are. In spite of that, there was an absolutely enormous turnout. How did you feel that mood was built up? I think it's been there for a very long time. There was an independence movement before Portugal agreed on the principle of independence in 1975. Then there was the Indonesian invasion, ironically at exactly the same spot that the Japanese army invaded during the Second World War. Then there were the years of the wars against the Indonesian occupation. The fall of Suharto once again created the possibilities, this time through a UN-controlled referendum, of the independence movement taking off. I've never seen people so determined to vote. I arrived at the first polling station at about 5.30 in the morning for a 6.30 opening. There were already 500 people waiting outside. My job was to verify that the ballot boxes were empty. It was excellently run. The idea that UN staff were telling people how to vote is complete nonsense. The UN staff were painstakingly careful in everything they said and did, and many of them were assaulted and shot at for their pains. I was at a polling station and was attacked by a mixture of gunfire and rocks during the day. The people scattered, came back and continued voting. The determination was there. What happens now is hard to say. Immediately, the movements in Indonesia itself are important, but one should remember that the main political parties in Indonesia don't really disagree on East Timor. Habibie has agreed reluctantly to a UN policing operation going in. Megawati is worse than Habibie on East Timor, and one shouldn't have too much hope that there's going to be any good there. There are very strong student movements and there is a strong nascent trade union movement that's trying to organise workers, particularly those who work for multinational companies earning disgraceful wages. And there are significant independence movements in Aceh and Irian Jaya. Do you think it's possible that when the parliament meets in a couple of months there will be a renewed burst of the student movement? This may be an important element in creating the space, contrary to what Megawati might want, for the East Timorese finally to grasp independence. In a perverse way, Megawati represents social forces she doesn't really agree with. She has been propelled into a position of prominence and leadership largely through family connections. The people who follow her see her election as a change in economic strategy from Habibie. But in reality the economic strategy that she put forward is hardly different to anything Suharto or Habibie have done. She's following a very bellicose nationalist line, that East Timor must forever be a province of Indonesia. In legal terms it's a complete nonsense. East Timor was never part of Indonesia. It was a Portuguese colony for several hundred years. It should have had its independence, and it still must have its independence, and we must do everything we can to support that. I think they haven't understood what Megawati was about, and also just how politically out of control the Indonesian army is. The army isn't really accountable to anybody and has no intention of being accountable to anybody. It is extremely powerful, extremely rich, extremely well equipped, and in a crude sort of way quite well organised. What the military can't cope with is massive industrial and social unrest of the sort that removed Suharto from office--and that's what they're fearful of. What are the prospects for the growth of trade union type organisation? It's going to be hard, and it will require as much international support and solidarity as can be mustered. But it's got to be a way forward. The economy of Indonesia essentially relies on virtually no controls whatsoever on environmental pollution, and so the pollution levels in Jakarta are the worst I've ever experienced anywhere in the world. It also relies on very cheap labour. People who work in appalling conditions in factories in the other big cities send a lot of their wages back to impoverished people in the countryside, and so there's an interrelationship there. The trade union movement, if it's strong and capable in the industrial sectors, has a big effect on the countryside as well. I was struck by the dreadful poverty of the mass of the population. East Timor is different in lots of ways, partly because it is under complete military occupation. The British government has recently done a U-turn on the question of arms sales to Indonesia--but it seems that it's too late to save any credibility. In parliament in July we raised reports that we'd received of Hawk aircraft flying over Dili. The British government claimed that it had an assurance from the Indonesian government that they weren't going to be used again in East Timor. We later heard that they've been used in Irian Jaya and Aceh. I was at the UN human rights session in Geneva at the beginning of August, and I was told there by people from Aceh that Hawk aircraft were used. The reality is that if we sell arms to the Indonesian military, they're going to use them, and they're going to use them for internal repression, because that is the function of the Indonesian military. There is no external threat to Indonesia--none whatsoever, and they know that. The one good thing to come out of this, if there is anything good about it, is that, for all the killing, the world at last understands the very close relationship between multinational corporations exploiting cheap labour or mineral resources in Indonesia and the sale of arms to the Indonesian military which are used to repress those very people. I hope that lesson is well understood. How did your involvement with Indonesian politics begin? I lived in Indonesia for nearly 20 years, and after Suharto came to power my husband, along with hundreds of thousands of others, was arrested. Three years later I was arrested. I spent three years and my husband spent 12 years as untried political prisoners. My British nationality meant that I was released much earlier than most prisoners. The Indonesian authorities were worried about conflict with the British. They released me on condition that I made no complaint about my treatment and that I would leave the country and never come back. I came to London in 1971. After a year of low key campaigning, I decided to start holding demonstrations. The first small demonstration, just family and friends, was quite successful because my sister worked in films and knew a number of actors, who came on the protest. We set up Tapol in 1973, campaigning for the release of political prisoners, of whom there were still 70,000 to 100,000. Quite quickly we began to take on other issues--West Papua, a new generation of political prisoners, and then issues around the 1975 invasion of East Timor. In what ways are the mass movement in Indonesia and the situation in East Timor related? For the general public in Indonesia, East Timor has been a side issue. Ifs rather like the Northern Irish situation for the British public--there is interest when there is a bomb or something happens, but most of the time it is not a central concern. A small number of devoted and committed non-governmental organisations, and some people in the student movement, are very aware of the situation in East Timor and support its right to self determination. For the political elite, East Timor is something with which to beat Habibie. The blame for what has happened in East Timor lies with the army. But the logic of the elite's criticism of Habibie is that they do not want to oppose the army. This is a paradox, because the fall of Suharto has exposed the army more than ever before as a violator of human rights. Yet many people don't yet connect what is happening in East Timor with the army's record. Many people never really expected the East Timorese to vote against Indonesia. The vote stunned them. Just as the recent events in East Timor were taking place, the radical elements in the pro-democracy movement were developing a campaign against the new state security law which is being debated in parliament The army support this law because it would give them special powers, and would allow the government to declare a state of emergency or even martial law. Pro-democracy people feel very threatened by this. They have been demonstrating against the law, but not about East Timor. Yet the government did declare martial law in East Timor. So these issues are running parallel. Is the army's aim to intimidate other liberation movements and the mass movement in Indonesia by taking a hard line in East Timor? This is a warning to the Acehenese and the Papuans. The Indonesian political elite itself is out to curry favour with the army to ensure that its presidential candidate is elected. In a recent vote for the chairman of the Jakarta City Council, where Megawati supporters are a majority, the army candidate beat the Megawati supporter. It appears that Megawati told her supporters to vote for the army candidate. It seems as if the armed forces are in some disarray--they've been humiliated by having to accept outside intervention in East Timor. It's difficult to predict how wounded the army will be. What is your assessment of the attitude of the US and the other western powers? One former US national security adviser described East Timor as 'a speed bump on the road to the great goal of stability in Indonesia'. That kind of cynical remark is typical, and probably in the minds of all those people in the corridors of power. The problem for them is that East Timor became such an international issue. That's why Habibie had to act in the way that he did. The western powers realised that there could be no solution to East Timor without the East Timorese people being given the right to decide. It was too big an issue and it would have dogged Indonesia until it was resolved. If the western powers wanted a good partnership with Indonesia, regardless of who is in power, then they had to get rid of the East Timorese issue. Doesn't the proposed UN solution leave far too much power in the hands of the Indonesian army? And isn't asking the Australian army in a bit like asking the fox to guard the hen house? It's so amazing, when the Australians have played such a bad role. The UN made a huge blunder in handing over security for the ballot to the Indonesian forces. Governments don't seem to understand that these people are a gang of monsters--that's why the Labour government is still selling arms to them. The UN Security Council resolution does not require the removal of the Indonesian army, which still holds the same position as before. The problem with the UN is that they want to keep a good relationship with the armed forces. Governments have to understand what a killer regime this is. The Indonesian armed forces have not changed their character--they are killers, thieves, looters, rapists. The problem is that what we call the international community do not want to accept this, but no one in East Timor will want to return to their homes when the army is still there. Dita Sari was imprisoned for trade union activities under President Suharto. She has recently been released. Tell me about your time in prison. I was arrested in July 1996, after leading a demonstration of 20,000 workers from 11 factories in Surabaya, East Java. I was charged with being opposed to the state's institutions. After 26 July 1996, when Suharto decided to destroy Megawati's organisation, they tried to scapegoat my political party, the PRD (Revolutionary Democratic Party). Suddenly, charges were added under the anti-subversion laws for violating the state ideology. The government accused us of being communists, which in Indonesia carries the popular association with the 1965 coup attempt and with being anti-religion. I was given a six year sentence, reduced to five years on appeal. The first two years I was in prison I wasn't subject to physical intimidation, but they did try psychological intimidation. I wasn't allowed to read or write, listen to the radio, look at newspapers or television, or even listen to music. You know nothing about what is going on outside. You are isolated. They want to kill the spirit. They wanted to make me as unpolitical as possible. But it didnt work. How did your situation change with the fall of Suharto? When we were arrested, people began to see that the PRD was a scapegoat for the government. Our being in prison added to the accumulation of anger at the suppression of the pro-democracy movement. Finally, two years later in May 1998, the students took to the street. They led the masses of ordinary people and they occupied the parliament building. it was a rejection of all that the government had done in 32 years. Our imprisonment did not have a direct influence, but it was part of convincing people that no more activists or trade unionists should go to jail. Suharto dug his own grave. The PRD learnt a very hard lesson after our imprisonment. We never saw the attack on Megawati coming. We thought it would be too costly, too risky, for Suharto to attack Megawati and then blame the PRD. But he did, and we suffered. We had declared the PRD as a legal party on 22 July 1996. Five days later we were all wanted by the government. Suddenly we had to work in a clandestine way. All our tactics and strategy had to change. Even the structure of the party had to change. We could no longer approach the masses with the banner of the PRD. We had to work with semi-legal and illegal forms of organisation. The PRD was set up as an open, legal party. Now, because of the repression, it became half-legal, even illegal. We set up committees of workers in industrial areas. We had to start from zero. Did this experience of working underground mean the PRD was slow to adapt once the political space opened up again with the fall of Suharto? In late 1996 and for the whole Of 1997 we had two tactics for organising the masses. First, the usual method--give out leaflets, involve people in discussion, set up local cells, but without the banner of the PRD using committees like Kobar. Second, we tried to work in existing organisations, like parts of Megawati's organisation. At that time there was a big debate about changing the political direction of our organisation. The debate was about whether we should concentrate on where big numbers were organised, as in Megawati's party, or whether we should continue to grow at the grassroots level, on our own. Some said we should go into Megawati's organisation and radicalise it. Others said that we must stay with the workers, even if some of us work in Megawati's party. There was also another debate about whether the students and the urban poor, who were taking the lead in the struggle, were more important than the workers. The workers were always so slow--I love them, but they were so slow! But the other faction said no, we have to stick with the workers because they represent the future. We cannot just leave them. After a huge debate the party decided we were still with the workers, but it's not the top priority any more. Before the workers were the top priority, and then the students. Now it was the students, the urban poor then the workers. How do you see the growth in workers' consciousness between the fall of Suharto and the mass demonstrations outside parliament in November 1998? They became politicised, but very slowly. I always give an example of a train--the students are at the front of the train, but the workers are in the last carriage, maybe even the restaurant car! It's so slow. Issues like the dual function of the military, Suharto's cronies, corruption and nepotism--the workers got the message about these things. They read, they know this is a corrupt country, a corrupt military. They have this in their minds, but when it turns to practice they still talk about wages. When we try to get them out on the street about the more political issues they just back off. Very few consciously want to join a political demonstration. So consciousness has developed, but very slowly. Before May 1998 they did not have very clear ideas about corruption or the dual function of the military. But after May 1998 it became very clear because it was in the papers, on television, even in the songs that the urban poor sing on the buses and trains. Now it is the task of the party and the unions to make it materialise in physical actions rather than just think about it. The November demonstrations were as big as those that brought down Suharto. Many in the student movement thought they would be enough to bring down Habibie, but they didn't. What conclusions did people draw? The demonstrations were part of the students, effort to complete the democratic revolution. In May 1998 it was only the regime that was changed, not the system. The students were not satisfied because Suharto was not being brought to court, the dual function still exists, the judicial institutions are still corrupt and all the old generals are still in their positions. So in November 1998 they saw an opportunity to complete the democratic revolution. But it was not so well organised, even though millions of people took to the streets. It wasn't that the masses weren't ready. But the people at the core of the masses weren't ready--not in terms of consciousness, but in terms of physical organisation. At the beginning of this year the movement seemed to lose its way, to fragment when it had to decide how to participate in the June elections. Yes, they fragmented. It's a problem with the democratic movement. There's an old fashioned notion that the student movement represents a moral force, not a political force. So there is no need for the student movement to go to the people, to organise the workers or the urban poor. Students simply respond to each crucial event. But other student' groups, under the influence of the party, see that it is the job of the students not only to lead the democratic movement but also to go to the other classes to organise them, to create a political force, a class consciousness among workers. The party tried to show how to bring workers into alliance with the student movement, but it is still really difficult because of sectarianism and a feeling that 'we don't want to be under the influence of the PRD'. Earlier this year Kobar members toured Britain raising funds. After they went back the new national workers' organisation, FNPBI, was formed. Tell me about that. The conference was a long time in coming. I was very angry when I was in jail. Every time they visited me I asked them, 'When will the conference be held?' And they'd say, 'Not yet, we don't have the money.' Finally, they came and said, 'We are having a conference.' It's not because they didn't think it was important. It's a big step from setting up local unions like Kobar in Jakarta to coordinating all the different regional unions under one umbrella, the National Front of Indonesian Workers' Struggle (FNPBI), We wanted to provide them with one method and one perspective. Education is very important in setting the direction in which the struggle should be going. A national programme is important in overcoming regional sectarianism. We decided that the new union would not be politically affiliated to the PRD, so it can be more flexible in approaching different kinds of members. We are not a political party. We have to open ourselves as wide as possible so that all the masses can join. Let them come, as long as they want to fight. Once they are inside we will educate them. Of course, people still identify me with the PRD and there is an historical relationship. But we want to be a union, and to recruit as widely as possible. How did the PRD's election strategy work? It seemed to be on the one hand standing candidates but also calling for a boycott. There were lots of questions about these issues. Inside the PRD, as well, there were some cadres who didn't want to join in the election campaign. But there was an opportunity to campaign very openly after years of being underground and distribute our leaflets and our programme. We believe that we cannot just ignore the illusions that people have--they still see the election as a very important event in achieving change, in replacing the existing leaders. Millions of people agreed to participate in this election, even though it was run by the old regime. We believed we had to follow where the masses go--even though some of the PRD cadres were against participation--otherwise we would be isolated. I thought at the time, 'Why? We don't need to join the elections.' But then I realised that if we hadn't joined the elections we wouldn't be as big as we are now. We now have 200 branches--before the elections we only had 50. Lots of new cadres came into the party because for the last nine months we were able to speak openly to people. It's not just a tactical decision to participate in the elections--it's also a question of the basis on which you intervene. The SWP participates in elections, but only on a platform which says to people, 'Vote socialist, but the election won't change anything unless there is a rank and file movement which is capable of overthrowing the whole system.' There seems to be a discussion within the PRD on how far you raise the question of socialist revolution. In the elections we are surrounded by the parliamentary system and we had a chance to campaign in this space. We had a chance to mobilise our supporters, as Lula's Workers Party did in Brazil in 1979--to educate the masses and test our influence. But the question of the interrupted or uninterrupted revolution is different. In 1994 I read lots of material about uninterrupted revolution, Trotsky's The Revolution Betrayed and everything. But I still agree with the two steps of revolution approach. The democratic revolution is the first task the first stage of the revolution. In Russia in 1917, the February Revolution is not really completed and they have to carry it through in October 1917. This is still a completely bourgeois revolution. Before they could lead the peasants they had to overthrow the semi-feudal structure in Russia of that time. But October was a socialist revolution. No. Not until autumn 1918, when finally the soviets went to the countryside and the poor peasants set up their own committees. How do you see the connection between the crisis in East Timor and the Indonesian Revolution? I don't think the military is becoming stronger. 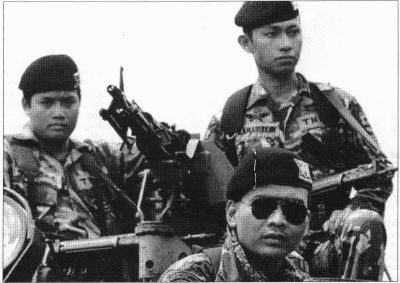 The dual function is still upheld after the fall of Suharto, but people have begun to learn about the real face of the military. This is especially true in the East Timorese case, where international pressures has emphasised the role of the military in the militias. The military feel humiliated by having to give up East Timor to UN forces. This situation creates factions within the military itself. Many of the military feel betrayed by Habibie. But the result of the referendum and the pressure from international sources means that there is not a lot the military can do. Of course, it can still kill people, but it won't be legitimate in the way that it was under Suharto. There is therefore a tendency for the military to want to make a coalition with civilian political forces. The main target for the military to make a coalition with is Megawati's party. She has welcomed the military into her official structure--she never directly opposed the dual function. The military needs more time to consolidate after all the problems it has had to confront.